I’m very relieved to tell you about a cross-cultural experience we did NOT have to have a couple nights ago, and that is a trip to the emergency room. We decided to take dinner out onto the patio, where sits a fairly flimsy plastic table with 2 chairs – one broken, one not. We moved 2 more chairs out, one with Naomi’s booster seat, and ate curry and rice. I had poured myself a mug of hot water, and set it on the table. Moments after I’d tried the water to find that it was still too hot for me (burned my tongue, to the degree that I couldn’t taste anything on that part of my tongue), Naomi started getting squirrelly. Before we knew it, she had kicked at the table and sent everything on it topsy-turvy, and the entire mug of hot water splashed down onto her legs. My stomach immediately sank. Daniel and I both immediately jumped up, and as fast as I could I unstrapped her from her booster seat, picked her up and Daniel pulled off the pants and socks she’d been wearing. Looking back, I know that if the burn had been a lot worse, this would have been a very bad move, since the skin could have stuck to the pants and tearing them off like that could have done a lot of damage. But as it was, this ended up being a good move, as the polyester might have trapped the boiling hot water against her skin. As fast as we could, we rushed her into the bathroom, set her in her little plastic bathtub, and started the cold water running into it. By this time she was screaming bloody murder, and I was crying myself, looking at the angry red color that the skin all over her legs was turning. I’ve since talked to a few other moms (including my own sister) whose kids have had burns that turned out even worse than this one, and their kids are perfectly normal now. Some of my panic was probably just that Naomi had never had a burn this big or this bad before, so I didn’t know what to expect. We added some ice from the two little ice trays in our freezer to help make the water colder. 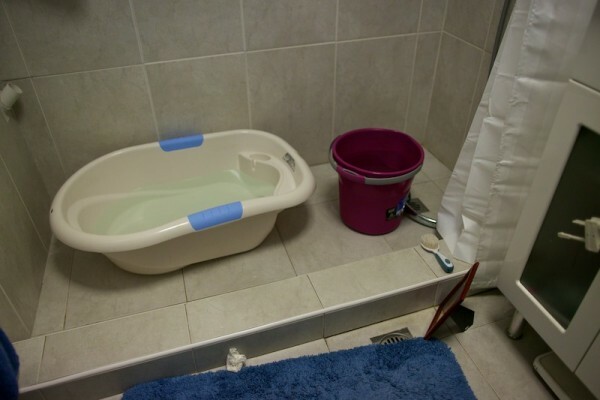 Then we realized that the problem with the bathtub was that we couldn’t get the water to cover her legs high enough without setting her in up to her waist, and as she was already trying to climb out of the water I didn’t really want to do that if we could help it. As someone who has iced my legs in ice water before, I knew how painful it can be, and I hated to keep putting her back in, but I knew it was better for her to deal with the temporary discomfort of the cold than to deal with the long-term discomfort of skin that had been burned worse because it hadn’t been cooled quickly enough. Instead, we tried putting her legs in a bucket that was deeper and could cover her up above her knees, where the burn reached. The next thing we did after getting Naomi’s legs in cold water was to call the nurse help line, a free public service number we had gotten from someone about a week earlier when Naomi had had a low fever (just in case the fever had gotten worse). I talked to the nurse while Daniel sat with Naomi, who was still screaming wildly. Especially considering how scared I was at the time, it was really hard to remember things like saying Naomi’s and my birthdates in the order of day/month/year (as opposed to the American way of saying month/day/year), or what was my new address or phone number (I didn’t even know my phone number, so I had to look it up on Daniel’s phone). The nurse asked a lot of the questions the nurses on help lines in the US would ask, like is she breathing and responsive, etc., although this nurse also checked to make sure the burn wasn’t from lightening or an electrical burn. She also asked about the size of the burn area, like what percentage of her body it covered. This was hard for me to estimate – I’m already pretty bad at spatial reasoning. And it meant Daniel had to lift her out of the water several different so I could check things, which started Naomi crying all over again, each time we had to do it. The nurse asked if it was 10% of the body. I said maybe. Then she asked how many palms of Naomi’s hand would cover the area – was it 5? I said probably. The strangest question she asked was whether Naomi or I was of Aboriginal or Torres Strait origin – not what ethnicity we were in general, but specifically if we were of that ethnicity. Interesting. At the end of the call, the nurse recommended we take Naomi in to the emergency room, with the burn wrapped in a wet cloth. Before we moved here, we’d figured out where our closest hospital was, and what the procedure would be in terms of payment and our stateside insurance coverage, in case we needed medical help while here in Australia. I was glad we’d done that, but it still felt daunting to actually get there and go through everything, being in a different country and wondering what would be different or the same as at home. We started figuring out how we would get there, whether we should take the train or taxi, and decided calling a taxi would be best. I started packing up different things we should bring with us, while Daniel sat with Naomi in the bathroom. By this time, Naomi was completely calm – even playfully kicking in the water a little. It was maybe 45 minutes after the accident. After I’d packed some things up and posted a quick prayer request to Facebook (which felt a bit hopeless, when I realized it was about 2 in the morning in California), Daniel called for a taxi. The dispatcher couldn’t give him an estimate on when to expect the taxi, and this made me feel anxious. It felt so urgent that we get Naomi in as quickly as possible, and now we had to wait on a taxi and we didn’t know when it would arrive? I felt so powerless, when it seemed so important for my child. We ended up deciding that Daniel would go down the street to try and flag down another taxi, unless this taxi arrived sooner. I didn’t really want him to leave, but this seemed like the best thing. After he left, I actually think it was good for me to be alone with Naomi with nothing else to have to do to get ready, because it let me see how well she was doing, which I hadn’t really noticed before. She was asking to get out of the water, and at first I told her we needed to stay in the water. But as I noticed how carefree she was, I thought it would probably be ok to let her get out of the water. After all, I’d read before that immersion in cool water should last at least 15-2o minutes, and it had been much longer than that. Plus, the nurse had said to wrap Naomi’s legs in a wet cloth when we came to the ER, but that that was just for Naomi’s comfort. So if comfort was the only factor, why not let her get out? One somewhat random thing that was interesting to me as a parent during this time, relates to Naomi and Jesus. 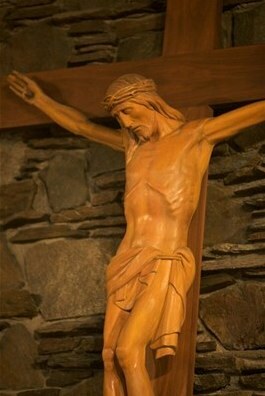 We have a photo that Daniel took of the carved wooden Jesus on the cross from our church at home. It’s a special picture to me, because I particularly love that depiction of Jesus, and it deeply ministers to me. I had Daniel take it specifically for the labor and birth of Naomi 2 years ago, so that I could look at the picture of it as I labored. I brought it with us to Australia and Naomi really likes the picture. She often says hi to Jesus, and likes to offer Him bites of her breakfast and blow Him kisses. It’s really sweet. She also seems very interested in the fact that Jesus had owies, and talks about it a lot when she looks at the picture. So I brought the picture into the bathroom, thinking maybe she’d like to look at the picture since Jesus had owies similar to the owies she had now. But she didn’t really seem interested in Jesus. What this impressed upon me was: I am the primary and most recognizable face of Jesus to my child. She may be interested in Jesus, and I believe even children her age can have experiences of Jesus directly. But when it comes down to it, as far as I know, she doesn’t have much actual relationship with Jesus at this point. She may have a positive impression of Him, but He’s still pretty unfamiliar to her. That’s why she has parents – to introduce her to Him over time. To be the hands and arms and legs and heart of Jesus to her – loving her like He does so that when she’s old enough to understand who He is she can believe and receive that that is how He loves her too. So in a situation like this, Naomi won’t find comfort in a picture of Jesus like I do – rather, she wants her Mommy and Daddy whom she knows and trusts. This is kind of a “duh” thing, but it was something I hadn’t seen so clearly in an actual circumstance before. By the time Daniel came back with a taxi waiting downstairs, Naomi was doing so well that we talked about whether we should take her in at all. On the one hand, I always prefer to err on the side of safe rather than sorry. It would cost us some money, but that’s never as important as our child’s well-being. On the other hand, it was almost bedtime and not only was she acting totally normal, her skin looked so perfect you couldn’t even tell anything had happened to it – it wasn’t even red anymore. We ended up deciding to just let her go to sleep, and if anything changed or if she woke up crying, we could always go in then. Turned out to be a fine decision – she’s been totally fine ever since. Talking about it later, Daniel and I wondered how things had turned around so quickly. It was hard to imagine that she spilled almost-boiling water on herself, after I’d just burned my tongue on it, and that her skin was so perfectly fine, only an hour later. On the one hand, she had been wearing pants and this could have helped be a barrier between her and the water, and we got her into cold water right away. But on the other hand her pants were very thin polyester and don’t seem like they would have done much. So, although we can’t figure out exactly what happened – whether it was explainable or miraculous – we’re really glad that everything turned out alright, and that we did not have to find out what it’s like to visit the ER in Australia. 3 Responses to Cross-Cultural Field Trip to the ER? No thank you. Oh. My. Goodness. How scary! Mirren’s never burned herself but I can only imagine the panic mode if she did. Thank Jesus Naomi is ok!!! That is really scary Katie. I’m glad to hear that Naomi is ok. She’s a tough kid.